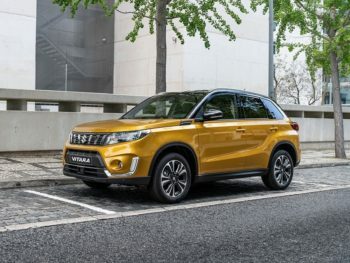 Suzuki will launch a revised version of its best-selling Vitara compact SUV in September, featuring two turbocharged petrol engines and no diesel version. Suzuki quadrupled its fleet sales last year, helped by the success of the Vitara. Launched in 2015, the Vitara has become a core part of the brand’s renewed efforts in fleet, where it is the biggest-volume model. Last year, it quadrupled its ‘true fleet’ sales in the UK, with plans to grow another 50% by 2020 – that’s despite removing diesel engines from the range earlier this year. Fuel consumption figures for the 2019 Vitara have not been confirmed yet, pending testing under the new WLTP test cycle. However, the newcomer will be offered in three trim levels (SZ4, SZ5 and SZ-T) with a choice of two turbocharged petrol engines. There will still be no diesel version in the UK, and the 1.6-litre non-turbo petrol engine has been dropped. SZ4 and SZ-T models will get the 110bhp 1.0-litre three-cylinder Boosterjet, the latter offered with optional four-wheel drive. The SZ5 will get the 138bhp 1.4-litre four-cylinder Boosterjet. Updated versions are marked out by a redesigned front bumper and new lighting, as well as soft-touch materials used inside.